None of the existing articles  give a comprehensive explanation of how metaclasses work in Python so I'm making my own. Metaclasses are a controversial topic  in Python, many users avoid them and I think this is largely caused by the arbitrary workflow and lookup rules which are not well explained. There are few key concepts that you need to understand to efficiently work with metaclasses. If you haven't heard of metaclasses at all, they present lots of interesting opportunities for reducing boilerplate and nicer APIs. To make this as brief as possible I'm going to assume the creative types  will read this. This means I'm going to skip the whole very subjective “use metaclasses for this but not for that” conundrum. A high level explanation is necessary before we get down to the details. The class statement isn't just syntactic sugar, it does some extra things, like setting an adequate __qualname__ and __doc__ properties or calling __prepare__. Look at me, I work like a function! Metaclasses rely on several magic methods so it's quite useful to know a bit more about them. When you define a magic method in your class the function will end up as a pointer in a struct that describes the class, in addition to the entry in __dict__. That struct  has a field for each magic method. For some reason these fields are called type slots. Now there's another feature, implemented via the __slots__ attribute . A class with __slots__ will create instances that don't have a __dict__ (they use a little bit less memory). A side-effect of this is that instances cannot have other fields than what was specified in __slots__: if you try to set an unexpected field you'll get an exception. For the scope of this article when slots are mentioned it will mean the type slots, not __slots__. Does Class.__dict__ have a foobar item that is a data descriptor ? Does instance.__dict__ have a foobar item in it? Does Class.__dict__ have a foobar item that is not a data descriptor ? Does Class.__dict__ have a foobar item? If yes, return the result of Class.__dict__['foobar']. If the attribute still wasn't found, and there's a Class.__getattr__, call Class.__getattr__('foobar'). To avoid creating confusions with the “.” operator doing crazy things I've used “:” in this diagram to signify the location. Because classes needs to be able support the classmethod and staticmethod properties  when you evaluate something like Class.foobar the lookup is slightly different than what would happen when you evaluate instance.foobar. Does Metaclass.__dict__ have a foobar item that is a data descriptor ? Does Class.__dict__ have a foobar item that is a descriptor (of any kind)? Does Class.__dict__ have a foobar item in it? Does Metaclass.__dict__ have a foobar item that is not a data descriptor ? Does Metaclass.__dict__ have any foobar item? If the attribute still wasn't found, and there's a Metaclass.__getattr__, call Metaclass.__getattr__('foobar'). Does the object's class have a slot for that magic method (roughly object->ob_type->tp_<magicmethod> in C code)? If yes, use it. If it's NULL then the operation is not supported. object->ob_type is the class of the object. ob_type->tp_<magicmethod> is the type slot. One of the most common point of confusion with both classes and metaclasses is the __new__ method. It has some very special conventions. The __new__ method is the constructor (it returns the new instance) while __init__ is just a initializer (the instance is already created when __init__ is called). Now if you recall the previous section, you'd expect that __new__ would be looked up on the metaclass, but alas, it wouldn't be so useful that way  so it's looked up statically. This method is called before the class body is executed and it must return a dictionary-like object that's used as the local namespace for all the code from the class body. It was added in Python 3.0, see PEP-3115. The horizontal lanes is the place where you define the functions. Solid lines mean a function call. A line from Metaclass.__call__ to Class.__new__ means Metaclass.__call__ will call Class.__new__. Dashed lines means something is returned. Class.__new__ returns the instance of Class. The number in the red circle signifies the call order. Metaclass.__prepare__ just returns the namespace object (a dictionary-like object as explained before). 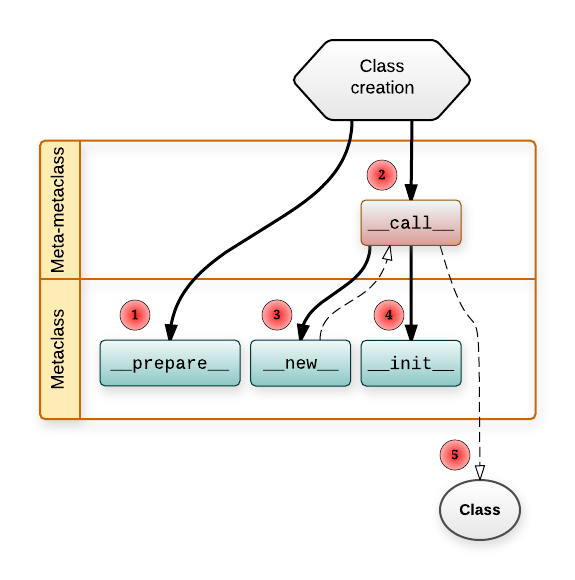 Metaclass.__new__ returns the Class object. So you see, metaclasses allow you to customize almost every part of an object life-cycle. If you use a function as the metaclass then subclasses won't inherit your function metaclass, but the type of whatever that function returned. One advantage compared to class decorators is the fact that subclasses inherit the metaclass. This is a consequence of the fact that Metaclass(...) returns an object which usually has Metaclass as the __class__. In the same tone of classes allowing you to have multiple baseclasses, each one of those baseclasses may have a different metaclass. But with a twist: everything has to be linear - the inheritance tree must have a single leaf. 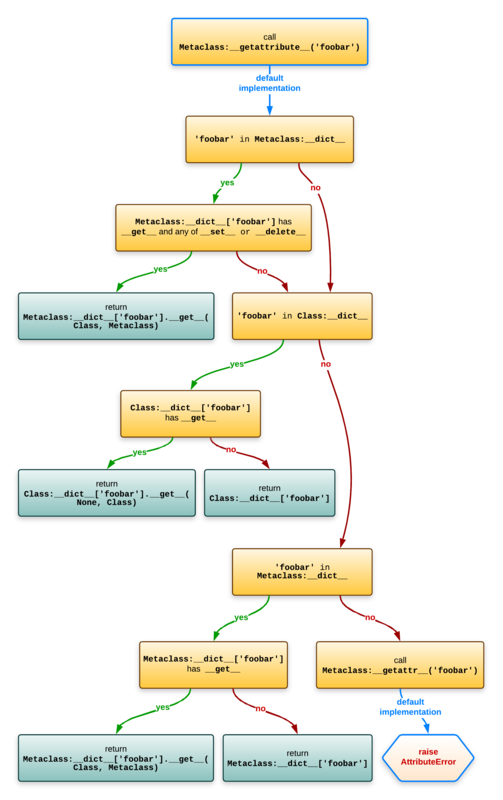 There are still few important details missing, like the method signatures. Lets look at class and metaclass with all the important stuff implemented. It's uncommon to see __init__ being implemented in a metaclass because it's not that powerful - the class is already constructed when __init__ is called. It roughly equates to having a class decorator with the difference that __init__ would get run when making subclasses, while class decorators are not called for subclasses. The __call__ method will be called when you make instances of Class. I've read these articles, they are great at piquing the curiosity but they only introduce the concept of a class factory and skip the much needed details of when __call__, __new__ or __init__ are called, what order, and from which objects. These one do briefly mention the details about call order, but I just don't like the way the articles are organized. Also, no nice diagrams. All in all, they don't explain it well. I'm not saying they are bad, they just don't resonate in my head. A notable resource is David Beazley's PyCon 2013 awesome Python 3 Metaprogramming tutorial, that you can just watch over and over. However it's still introductory material and because it's a video, searching for information is quite hard. There's also docs.python.org/3/reference/datamodel.html, which is thorough, but it's easy to get lost in the trillion of details presented there. It can be argued that the problem is the language having all sorts of unnecessary complications around the object model but that's not an argument against learning how it works. Take the bad with the good, as they say. You can't say “ don't use metaclasses ” just cause you don't like this particular feature of the language or don't want to spend the time to learn how it works. A programmer willing to go out of his comfort zone, learn new things and challenge common practices. If you're reading this then you probably want metaclasses. Or at least to understand them. New-style objects make this especially confusing, because different lookup rules for magic methods. Class.__dict__ is not a real dict but a special dict proxy that will also look in all the base classes. For clarity I've simplified things to Class.__dict__['foobar'] but in reality the __dict__ proxy object is not used, but instead all the logic is inlined: attributes are looked up on the class of the object in the order of the __mro__ via typeobject.c:_PyType_Lookup (called from object.c: _PyObject_GenericGetAttrWithDict). Also, in case you dared to read the C code and got suspicious: _PyObject_GenericGetAttrWithDict calls _PyType_Lookup quite early, because it might need to use the data descriptor  before checking the instance's __dict__. 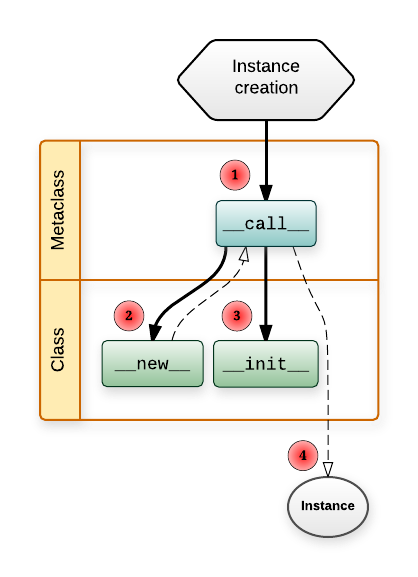 A struct in the C programming language (and many derivatives) is a complex data type declaration that defines a physically grouped list of variables to be placed under one name in a block of memory, allowing the different variables to be accessed via a single pointer, or the struct declared name which returns the same address. (1, 2, 3, 4, 5) A data descriptor is an object with both a __get__ and __set__ methods. See reference. Functions implement __get__ - that's how you get the “bound method”. However, functions are non-data descriptors . The the default __getattribute__ implementation for objects is in object.c:slot_tp_getattr_hook. It calls in turn Most of the lookup workflow is implemented in object.c:PyObject_GenericGetAttr and object.c: _PyObject_GenericGetAttrWithDict to do bulk of the lookup. For lookup in types (classes), see: typeobject.c:type_getattro and typeobject.c:PyType_Type. And that's how staticmethod and classmethod descriptors work if you try to access them via class. Whoa. It just returns itself if there's no instance. And there wouldn't be any when accessing an attribute via the class. In the source you're going to see things like object->ob_type->tp_call (source). No fancy schmancy lookup rules. In case you were wondering how it works with multiple inheritance, when a class is created it will copy the slots from its bases, see type_new (which calls PyType_Ready). In other words, lookups are precomputed - a stark contrast to how normal methods are looked up. Descriptors are also handled in that phase, see update_one_slot. All in all, there's an incredible amount of logic necessary to maintain the slots table. I suspect there are significant performance gains here (compared to old-style  classes that don't have slots). 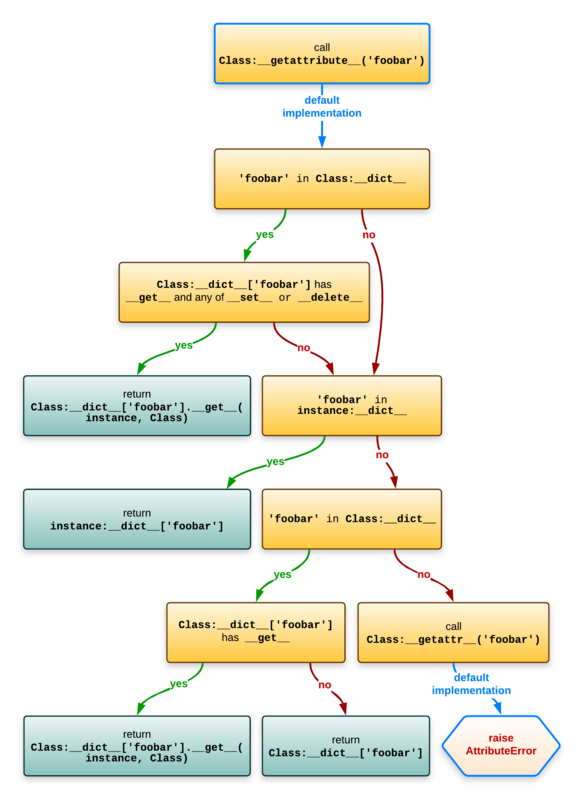 There were acute differences between types (classes implemented in C) and classes (implemented in pure Python) in Python 2 and especially when using old-style classes but it's more streamlined and consistent now in Python 3. If __new__() does not return an instance of cls, then the new instance’s __init__() method will not be invoked. ...     A class that only allows these attributes: "a", "b" or "c"
...     __slots__ = "a", "b", "c"
To sum it up, __slots__ will change a bit the memory layout of the instance so it doesn't have a __dict__ and will make the class have descriptors  for each of the fields. These descriptors will set/get the values into/from an internal array of fixed size. The __new__ method was added in 2.2 to allow subclasses to customize the constructor, in case they subclass builtin types. In Python 3 you can pass extra keyword arguments to the class statement, see docs. This feature is not available for Python 2. Similar entries: Publishing to GitHub Pages from Travis CI, Django and pip wheel, Cogen and greenlets. © Copyright by Ionel Cristian Mărieș. Powered by Pelican. Theme based on flasky.